The strain of a season full of expectations are finally starting to wear on Ron Zook, who is finding out that he might be more correct than he led on at the start of the season. The Fighting Illini are just 1 year removed from their Rose Bowl appearance, and after that game he mentioned that the team wasn't where they wanted to be yet. It's hard to tell the average Illini fan that, however. As I have said numerous times within the borders of this blog, Illini fans are a fickle group and the slightest teeter between the negative and the positive will usually cause wild fan comments. When things are going good, such as last year, then everyone is on top of the world and the talk of erecting a statue of Zook was a frequent topic. But, when things aren't going so well, then things get a little different. After a 55-13 dismantling of Indiana back on October 18, the Illini had regained some of that swagger that had eluded them much of this season. The Illini were poised to travel to Wisconsin and face a Badger team that had not won a game in the Big Ten this season. If ever there was a trap game, this was it. The Illini fell behind early, but found the endzone at the start of the second quarter as Juice Williams hit Zach Becker, a freshman backup fullback from St. Joseph-Ogden for his first collegiate touchdown. Watching Zach come through the ranks for the Spartans gave me a lot of pride to see him finally catch his first pass of his career, much less it be for a score. 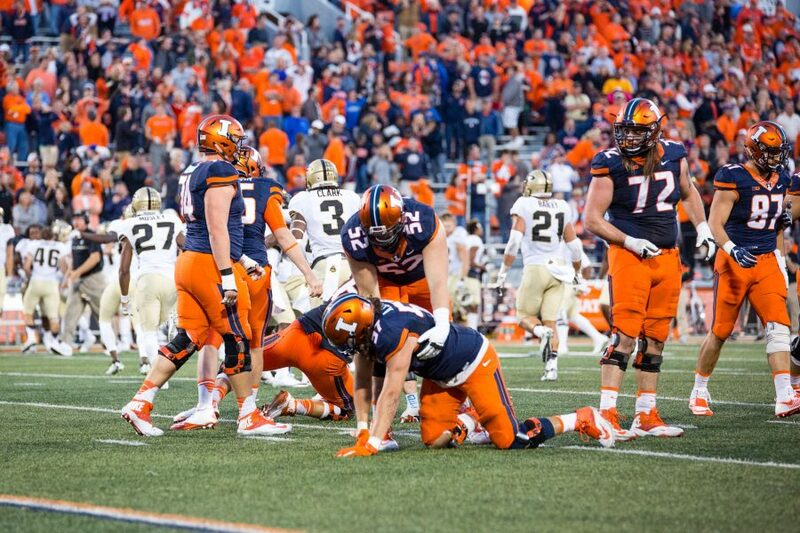 However, the Illini couldn't stay out of their own way as penalties and turnovers once again proved to be the deciding factor as the Illini dropped to 2-3 in the Big Ten and 4-4 overall. If ever there was a must win for Zook and his Illinois team, it is this Saturday, when the Iowa Hawkeyes come to town for a visit (2:30 pm central time, ABC). A footnote regarding television for the game; those fans out of the Big Ten market will be able to see the game on ESPN. Iowa is one of those teams that is hard to figure out. They come in at 5-3 overall and 2-2 in league lay, and feature one of the better running backs in the conference in Shonn Greene. The Hawkeyes were on a bye last week, and haven't played since they beat Wisconsin 38-16 back on October 18. For the Illini to retain any hopes of getting a bowl bid, this game must go in the win column. That pretty much sums it up. The curtain will rise on the 2008-09 Fighting Illini men's basketball team this coming Sunday afternoon when they host Florida Southern in an exhibition game at the Assembly Hall. The Illini will be young, and starting the season a little short-handed at guard play. The three seniors, Trent Meacham, Chester Frazier, and Calvin Brock will provide the leadership that will be sorely needed. The Illini had planned on having Jamar Smith back for another season, but you all know the story and how that particular chapter ended, so I won't go into any more detail on it. There are only two juniors on the team this year, juco transfer Dominique Keller and the ever re-appearing C. J. Jackson, who is done with football and wants to come back and give basketball another try. Keller, who hails from Texas, should give the Illini some depth down in the post. Jackson is a bruiser that may or may not factor in to the mix, given his fluctuating back and forth between sports. The conditioning will be undoubetedly the most difficult for Jackson, and we shall see how he handles all of it early on in the season. For sophomores, the Illini are absolutely loaded, as seven players dot the roster from that class. Mike Tisdale leads this group of upcoming stars, and will be expected to contribute to the void left by Shaun Pruitt, who graduated last year. Guard Demetri McCamey will need to keep his shooting skills in tact, because he will be one of the top guns early on. Mike Davis and Richard Semrau will also be expected to add some depth to the front line. Semrau, who has battled injuries and illness during his time as an Illini, seems to have put on some weight and is ready for the season to begin. Davis can be a wild card, and has good leaping ability for a 6'9 player. Bill Cole, who played sparingly as freshman, will also be asked to spell some of the post players. Jeff Jordan, who had some good moments last season, can also be that type of player who can come in and give McCamey and Meacham some needed rest. The final sophomore, Alex Legion, is the transfer from Kentucky, and must sit out the first part of the season as part of NCAA rules. He will become eligible in December after fall finals end. Legion could be that key that sparks the Illini once the Big Ten season begins. In summer workouts before the Smith debacle, Legion and Smith were the two best shooters on the team. The hard part here will be to keep Alex focused when it finally is his turn. The lone freshman on the team is Stan Simpson, a gangly 6'9 center, who may or may not be a factor this season. Nobody intends to redshirt at the start of a season, and according to Coach Bruce Weber, it is always ultimately up to the player to make that final decision. Whether or not Simpson decides to make that choice is anybody's guess right now, but if he doesn't and chooses to play, look for him to give Tisdale some much needed rest. Now, looking at this roster, you really don't see an NCAA Tournament team, do you? This team could very well surprise some people, but it will be in the non-conference portion of the season where we will really see what this team is all about. A tough road contest at Vanderbilt, a United Center matchup with Georgia, and the Big 10/ACC Challenge game at home against Clemson will be three games that will tell a lot of this story. However the season plays out, one thing is clear. The 2009 recruits are on the way, and if they are as advertised, things could get fun again at the Assembly Hall. Illini fans just have to exhibit a little patience. No, really, I mean it. Next week, I will preview the women's basketball outlook for the 2008-09 season, as well as get everyone caught up to speed on the fall sports scene on campus, and whether or not the Illini were able to get past Iowa and if their bowl hopes are still floating, or are flushed down the drain. Unfinished business, or a work in progress? Well, now that wasn't the way things were supposed to go. A beautiful October afternoon, many former alumni on hand to watch their beloved do battle, and a basketball court at one end of the stadium that was to stage the "biggest outdoor basketball practice" (more on that later). Then again, things happen for a reason, but the question I want to know is: Will the real Illinois football program please step forward? After an annihilation of Michigan one week earlier 45-20, the Illini finally returned home to their new renovated stadium with renewed hopes for a successful season and a possible warm destination for a bowl game. This one looked good on paper, but as the old saying goes, you don't play games on paper, and for good reason. The Illini, despite another good performance (at least numbers wise) from Juice Williams, who completed 26 of 41 passes for 462 yards and 2 touchdown passes, both going to true freshman A. J. Jenkins (right, #8) went down to defeat at the hands of Minnesota 27-20. Gopher coach Tim Brewster, who was making a homecoming of his own, came away the victor, and left scores of Illini fans exiting Memorial Stadium shaking their heads and wondering what they just witnessed. Brewster, who played tight end for the 1984 Illini Rose Bowl team, had to enjoy the feeling of knocking off his alma mater, and it was no secret that they were looking forward to coming in to Champaign with one thing on their minds. This continues a disturbing pattern for Illinois football teams of playing mediocre the year after a major bowl appearance. It happened in 1984 after the Illini went to the Rose Bowl (10-2 in 1983, 7-4 in 1984, but a free-fall after that). It also happened in 2002 after the Illini made their first ever BCS bowl appearance, the Nokia Sugar Bowl in New Orleans (10-2 in 2001, 5-7 in 2002, and everyone knows what happened after that). So, here we sit the season after another Rose Bowl trip, where the Illini went 9-4. Could they be heading in that direction again? The Illini currently sit at 3-3 overall, and even though there are 6 games left in the season, the prospects of running the table seem very unlikely at this point, especially with the likes of Ohio State, Wisconsin and Northwestern on the schedule. Too much emphasis is put on trying to match a previous campaign, and it is not like Zook doesn't have the horses in place to make it happen. For the second straight week, Williams set a stadium record in offensive output, having totaled 503 yards against the Gophers after piling up 431 in the "Big House" against Michigan just one week earlier. Now the win over Michigan doesn't look as impressive after the Wolverines were blanked at home by Toledo 13-0. I heard several people mutter as they left the stadium on Saturday that they are looking forward to basketball season, which is eerily reminiscent of 2005, when similar remarks were overheard. Bottom line is, Illini fans are frustrated, and you figure that you ought to hold serve at home against teams that you should beat. Another one of those teams visit this coming Saturday night when Indiana pays a visit to Memorial Stadium (7:00 pm central time, Big Ten Network). The Hoosiers were thoroughly embarrassed against Iowa in Bloomington last Saturday 45-9, and will come into town reeling. But, for some reason, the Hoosiers always give the Illini their best game and this one will be no different. The Hoosiers have a quarterback that moves much like Juice does in Kellen Lewis. Hoosier coach Bill Lynch has stated that Lewis is questionable for the game, but everyone suspects that he will play. For the Illini to come out on top in this one, they need to cut down the mistakes, hold onto the ball, and convert their chances for points. At least we're not Michigan. Following the football game, the basketball program (see below) held what was deemed the "World's Biggest Basketball Practice", but given the disappointing end to the football game, not many people hung around to see the event. For starters, the court was at the south end of the football field, and not very well visible by people on the north end of the stadium. The court, made by Flex Court in Kewanee, was to be auctioned off after the scrimmage, and the starting bid was to be $12,500. It is rather uncertain if the Illini would have pulled out the win over the Gophers to see if more people would have stayed to watch the basketball team. By my guestimation, about 5-6,000 people remained in the stands, while many others decided to return to their pre-game tailgates for Homecoming. Still, a nice idea by the DIA in trying to get more people to stay. The calendar may say October, but basketball season is just around the corner. Bruce Weber and Jolette Law unveiled their basketball teams to the media on Tuesday at Illini Basketball Media Day. Weber returns a young team that has 3 seniors, 2 juniors, 7 sophomores and 1 freshman. This will be a team that will attempt to come back after a 16-19 season that saw them just miss the NCAA Tournament by coming up short in the championship game of the Big Ten Tournament. On the flip side, Jolette Law will only have 9 players, with 2 seniors, 2 juniors, 1 sophomore, and 4 freshmen. Law's Illini also came up just short last season, getting even closer to the Big Ten Tournament title by losing to Purdue on a buzzer-beater. In the next couple of weeks, I will preview each of the teams, complete with analysis of position, leading up to the season openers for both squads in early November. Stay tuned for that. After nearly a month on the road, including a bye week with no game at all, Ron Zook brings his charges home to Memorial Stadium to face Minnesota for Homecoming in Champaign-Urbana. The place where this tradition began many years ago, the Illini will be glad to get back in front of the faithful. Not that the last few weeks have been totally bad for the Illini, they split their two games and had a chance to relax and heal some injuries with the bye week. The back end of the two game road swing, a trip to Ann Arbor, where the Illini never seem to play very well. The result was much better than anticipated, as Illinois rolled the Wolverines 45-20 in what could be labeled the Juice Williams show. All Juice did was total 431 yards of total offense, throwing for 310 yards, and rushing for another 121. The performance set a Michigan Stadium record for an individual performance, one that is not likely to be broken for quite some time. Williams threw 2 touchdowns, one to Daniel Dufrene, and the other one to Jeff Cumberland, which totaled 77 yards. Arrelious Benn caught 6 balls for 122 yards, but did not reach the endzone. It is dominance such as this that gives one the thought that maybe this Illini team is not that far from contending for a Big Ten title. Sure, the loss to Penn State didn't help in that regard, and they still have games against Wisconsin and Ohio State left on the schedule, so this could be a tall order for the 2008 season. Nevertheless, the Illini are now 3-2 overall and 1-1 in Big Ten play coming into the game against Minnesota (11:00 am, ESPN). This game has irony written all over it, since the Golden Gophers are coached by Tim Brewster, who was a tight end for the Illini back in the 1980's. I'm sure that Brewster would like nothing more than to beat his alma mater, who took his Gophers to the woodshed last year, 44-17 at the Metrodome in Minneapolis. So, I'm sure that is weighing on his mind as well. The next phase of the "Zook Zone" campaign will be unveiled on Saturday, when the Illini want the fans to "Rock The House". Fans are encouraged to bring their Zook Zone towels with them to the game and wave them when Minnesota has the ball. The fans are also encouraged to stand whenever the opponent has the ball, making Memorial Stadium a decided Illini Territory. 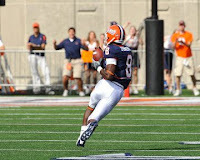 Hey, if Penn State can have a "white-out" at Beaver Stadium, why can't Illinois do the same with the color orange? It would make for quite a spectacle, and I'm sure the players would thoroughly enjoy the atmosphere. So, whadda you say Illini fans, those of you going to the game on Saturday......MAKE SOME ILLI-NOISE!! Immediately following the football game, Memorial Stadium will be transformed into the "World's Biggest Basketball Practice", showcasing both the mens and women's teams for the 2008-09 season. Flex Court Athletics, a company out of Kewanee, Illinois, is donating the playing surface for the event, which will take place in the horseshoe area of the stadium. Once the game clock hits zero, the players will come out and start warming up. Among the events to take place include a three-point shooting contest, slam dunk contest, and a short scrimmage. The DIA estimates that the event will last no longer than 45 minutes. So, if you're attending the game on Saturday, why not stick around a while longer and take in the first basketball practice in an outdoor venue. Up next week, a full report from Illinois basketball media day, as well as a preview of the Chicago Bulls and Utah Jazz NBA exhibition game, which will be at the Assembly Hall next Friday night.